All invitations to Miles of Music Island Camp are determined by lottery so that we are always expanding the circle of people who get to experience Miles of Music. Whether you're a new camper or a long-time alum, you must apply by filling out the lottery application by the advertised deadline. What kind of information do you need in your lottery application? We need some basic info, like your name, your contact information, and any social media info you want to share. We also ask about your musical interests, so we have a good sense of your goals for camp. Then we need to know what kind of food you want to eat, what kind of housing accommodations you prefer, and what your travel plans are. All of this information helps us make sure camp runs smoothly, and is an enjoyable learning experience for everyone involved! What if I’m applying with my whole family? If you are applying as a family, you can select ‘Family’ from the drop-down menu on the lottery application and add the number of members in your family to your cart. You will then fill out separate applications for each member of your family so that we have information for each person. You can repeat this process until your whole family is registered. You’ll then be asked to make a deposit for the whole family. For instance, if you have four family members, you will place a deposit of $400 ($100/pp). If you apply as a family, we’ll name your group and enter that name as many times as there are people in your family. That means your fates are linked, and you’ll either all get in or all get on the waiting list together. What if I’m applying with a non-family group? Maybe your whole band wants to come to the island together. Or maybe you only want to come if your best friend can come too. If so, each non-family group member must apply individually, selecting ‘Individual’ from the drop down menu at the start of the application, and enter the name of their fellow group members in the appropriate section of the application. For instance, if you and your music teacher want to come, you must complete the application, and so must your music teacher. You will enter your music teacher’s name in the ‘group’ section of your application, and she will enter yours in the same section of her application. This ensures that we pair you together when we run the lottery. We’ll then name your group and enter that name as many times as there are people in your group. That means your fates are linked, and you’ll either all get in or all get on the waiting list together. We will then let the whole group (e.g. you and your music teacher) know whether or not they made it on the island once the lottery is complete. All non-family group members must individually pay their $100 deposit to be eligible for the lottery. What if I want to come with a group, but one or more people in our group wants a Work/Trade discount? The first step for anyone who wants a Work/Trade job is to apply through the General Lottery and select ‘Work/Trade’ on the application. Any camper offered a Work/Trade job will have two weeks to confirm or deny that job offer. In that time, you’ll be able to find out whether your entire group has been accepted to camp (whether through the Work/Trade lottery, the regular lottery, or through a Merit & Community Discount). You can then make an informed decision about whether to accept our job offer. If you’re placed on the waiting list for a Work/Trade job, your name will be automatically entered into the regular lottery along with the rest of your group. The process will then proceed exactly as described in the “Family” and “Non-Family” FAQs immediately preceding this one. I am not sure if I can attend camp yet. Should I still apply for the lottery? YES. If you are interested in attending Miles of Music you should apply now even if you aren’t sure you can attend. If we offer you a spot and you’re no longer interested, you’ll have two weeks to cancel and get a full refund of your deposit. If you would like to remain on the waiting list, we will keep your deposit until the date advertised, when we will refund all deposits to people still on the waitlist. If you are sure you do not want to attend camp please send us an email and we will remove you from the waiting list and refund your deposit. I am applying for a Merit or Community Tuition Discount. Do I still have to apply for the lottery? YES. In addition to the lottery application, you’ll fill out a separate Merit & Community Discount Application. This way, if you win a Discount, we already have your registration information. And if you don’t win a Discount this year, we will automatically enter your info into the regular lottery unless you tell us not to! Why do you use a tiered tuition system? We cherish this community and the space we create together. We are committed to building a sustainable organization that will continue to grow for years to come. With all that in mind, we investigated other camps on subjects like teacher to camper ratio, total number of campers and tuition prices, organizational models and more. We looked at our own patterns over the past years and talked about what elements have made this camp so special and how we can maintain them. In full transparency, our actual cost per camper (at any age) is significantly higher than our tuition prices. In previous years, our tuition prices remained the same though our expenses increased. As people and as an organization we value accessibility, representation and diversity of ages, incomes, cultures, abilities and more. This led us to keep the camp tuition prices low, underpaying our staff, and relying on a few special fundraising events to fill the gaps. In an effort to move towards our sustainability goals, we developed a tiered tuition system that is designed to keep camp accessible by allowing you to choose what you can pay. The highest tuition tier represents our actual cost per camper on the island. The lower tiers maintain an accessible price while accounting for small increases in costs. We will continue to offer work/trade discounts and merit/community discounts. Our tiered pricing is made possible thanks to the generous support of our donors and to arts grants like Club Passim’s Iguana Fund. If you would like to make a direct, tax-deductible donation to Miles of Music Camp, please click here. If you don’t find your answer in our FAQ, email us. We’ll respond ASAP and do our very best to help! Thanks again for your support and consideration. I don’t sing. Is this camp just for songwriters and singers? Instruments and voices have equal billing. Whether you’re most interested in tune writing, tune accompaniment, song accompaniment, instrumental improvisation or just instrumental arrangement and composition within songs there will be classes and instructors to lead you as you explore. What if I’m an advanced musician? What will I get out of this? Think of this as a week-long master class where you get to interact, experiment, study, and even collaborate with other professional musicians who will be on staff and/or attending the camp as students. This island is an ideal getaway for a writer who just wants to spend time in a remote cabin writing new material (in fact, that’s how Laura and Kristin found this island in the first place!). We will inspire you and you will no doubt take home some new friendships with your peers in the music scene. What if I’m not an advanced musician? What will I get out of this? What a great place to begin your week. Think of this as a week to take your excitement into overdrive in a way that you just don’t have time for around the edges of your full-time job (whatever that may be). The new concepts, songs and tunes you will learn will keep you inspired all year. Come with an open mind and fuel your fire or take a journey you didn’t expect. What if I don’t sing or play an instrument at all? First, this camp is a fine place to come even if you don’t want to play music at all. (For instance, if you’re a spouse or a kid of someone who wants to come and play music!). You can swim, kayak, canoe, hike, do yoga, or just sit and listen to the music. Second, if you don’t play but you want to start, that’s just fine. The morning class periods will have an option for basic instruction on the most common instruments like guitar, banjo, fiddle and other instruments based on interest and our ability to find a teacher for you. Check in with us to discuss if you’re an absolute beginner. Afternoon electives will be available for all levels. Just be prepared to be a little over your head sometimes. (That can be inspiring if you approach it in the right way). Note: If you have been meaning to get started on an instrument we do recommend taking a few lessons on that instrument before camp, so you can get the most out of your week with us. If they’re four years old or older, bring them along. If they already play music, we’ll place them in the same classes as the adults because our experience shows that young and old musicians have a lot to learn from each other. If they don’t play music, we’ll find tutors to help them experiment during morning classes. We’ll have special activities scheduled for kids at various times throughout the week. That said, we don’t offer all-day programming for young kids. Your child is welcome wherever you go and in music classes on their own so long as they’re not disrupting class, but you’ll be responsible for keeping an eye on them. What if I’m a teenager? Come along!! If you’re under 18, your parents will need to designate a guardian to look after you. This could be a parent or another trusted adult at the camp. We strongly believe that teens are just as well-prepared and have just as much to offer as adults in music class and in the camp in general. We love your energy. There will be other teens at camp to hang out with. Can I rent or borrow an instrument there or do I have to bring my own? Bring your own instrument if you have it. The camp store will have instrument strings, tuners, and possibly some rental instruments. If you decide you want to learn an instrument while you’re here, chances are someone will be happy to loan you one for part of the day. It’s amazing. Seriously. If you want to learn more, you can read more about the location and facilities on the A.M.C. Three Mile Island Camp Website. 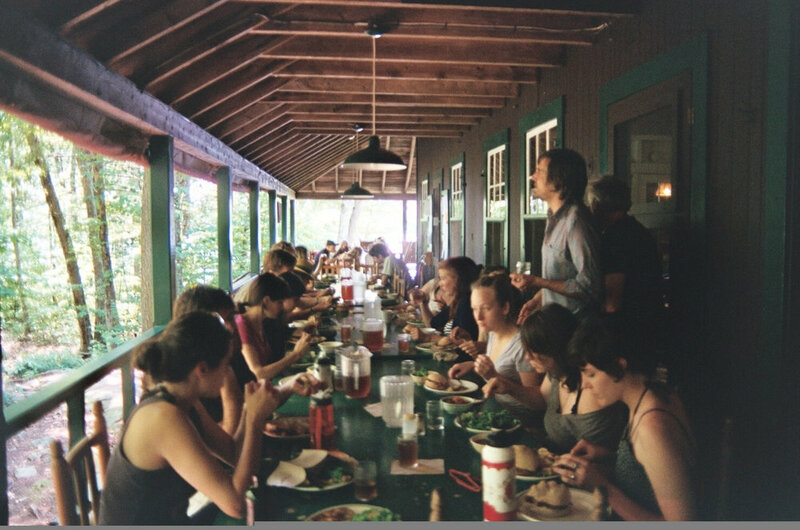 BUT KEEP IN MIND: Our camp takes place before the official Three Mile Island Camp season begins in late June. Our staff and activities are completely separate from the Island’s regular summer programming. If you have questions about something you read on their website, please ask us and we’ll do our best to clarify. Thanks! We love pups, but unfortunately they are not allowed on the island.